I was frantically searching the net for a easy dessert recipe that does not need full fat milk, khoya, freshly made cottage cheese, almonds or pistachios. Because I do not have any of these. am sure its available somewhere in the place where I am living right now , may be its lying there in the same rack in the super market where I picked up the soy milk for my kid. But I would never know as nothing is written in English and am tired running the google search all the time before picking a new ingredient for the kitchen. So I needed something that calls for fewer easily available ingredients and produces a gorgeous result. And then suddenly like a lightening I remembered this dessert which maa used to prepare a lot in our childhood. The locality we lived as child had no sweet shops and in our culture its simply impossible to be a good host unless you offer something sweet to your guests. so everytime some sudden guest arrived she used to make this with mere ingredients like bread, flour and sugar. Sometimes she also jazzed the dish up with homemade kheer or thickened milk. 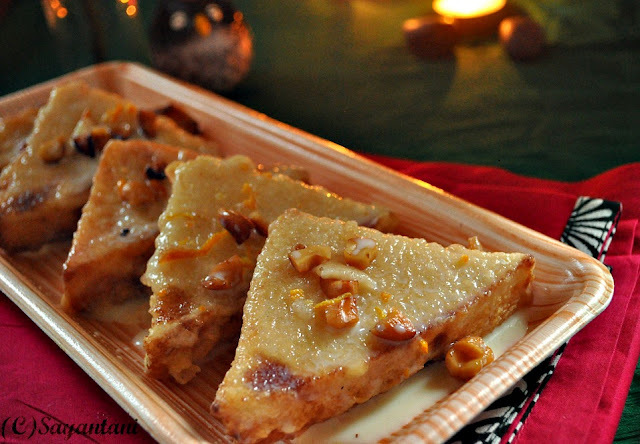 In many ways, its quite like the famous Mughal dessert Shahi tukra or Double ka meetha but has a batter fried outer layer, which makes this dessert divine once it soaks up all the aromatic syrup and the thickened milk. I used to make this a lot for my friends when I was in college but after that somehow forgot about it. Today when I prepared it again in not so familiar a place it felt like a piece of my childhood. It’s only us who create and relive familiar memories irrespective of the place or time. This Diwali I wish all your dreams come true. Live, let live, be happy and spread cheer with an affectionate heart and ever smiling face. Remove the brown edges of the bread completely. Diaganollay cut in two. If you are using beggier pieces then you might have to cut in 4. Make a moderately thick batter with the flour and 1 cup water. The idea here is to coat them really well so that it gets a nice outer layer when fried. With a fork or a beater beat it smooth and light. Make the syrup with the sugar and 11/2 cup water. Let the sugar melt and bring it to boiling stage and then decrease the flame and let it simmer for 3-4 minutes. Add the crushed cardamom. Switch off but keep it warm. Heat enough oil to deep fry in a heavy bottom pan or kadhai. Once it’s hot dip a piece of bread in the batter and carefully place in the oil. Keep the heat moderate and let it turn golden on both sides. Drain and place on a paper towel to soak the excess oil. Transfer it to the syrup when its still warm. Let it soak the syrup for 4-5 minutes. It should soak the syrup and be super soft but not mushy. If your bread slices are thick you might need to soak them for longer. Check and adjust the timing for best results. Then transfer to a tray. Heat the milk and once it start to boil decrease the flame and add the condensed milk. Stir and let it become thick for 7-8 minutes. I added finely chopped orange rind to flavour the milk. Once all the breads are fried and soaked in the syrup arrange them on a tray. Pour a spoonful of syrup on each piece and finally pour the thickened milk on top. I generally reserve half the quantity of the milk to pour on each serving just before serving. Also you can lightly roast some cashews or other nuts and sprinkle on top of the breads. You can save this for 2-3 days in an airtight container in the fridge. Sometimes frying in refined oil leaves a faint smell which may not be very pleasing. in that case add a tbsp of ghee in the oil while frying or up the amount of cardamom in the milk. 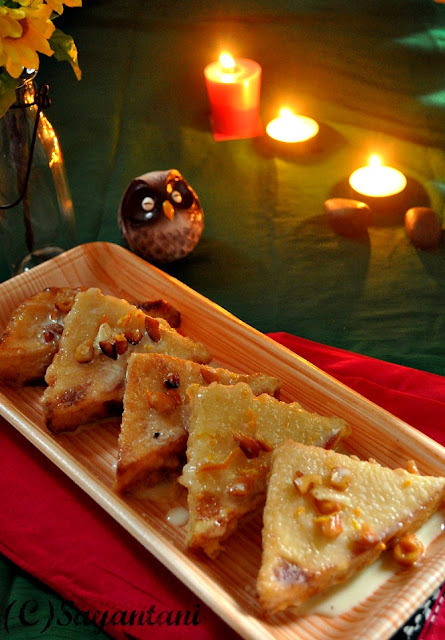 Participate n Win Wonderful Prizes - "Write For Us Contest"
Sayantani I almost said shahi tukda, nice version though batter fried. Got to try this quick one. Wishing you and family a very happy and prosperous Diwali dear! Looks very yummy & easy to prepare. Will definitely prepare this for Diwali. Diwali wishes to you and your family. 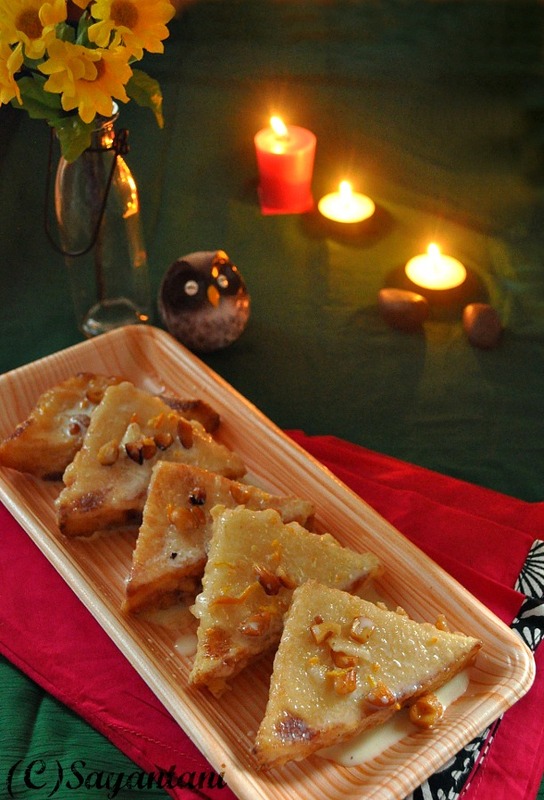 Delightful bread mithai, you proved that even with bread we can make a fabulous diwali special. Happy Deepavali wishes to you Sayantani. That is a great sweet to celebrate Deepavali in Japan? Wow, luks yum. Must try.